Easy mailing list and newsletter sign up forms are only a couple clicks away. Previously, we added real time notifications to our growing family of integration features. Since then, we’ve sent over 100,000 email addresses through the new platform to Campaign Monitor and MailChimp. To keep up the momentum and help make using those services even easier, we are excited to announce the ability to create Single Opt-In and Double Opt-In mailing list sign up forms in Wufoo for those two integrations. First, let’s do a terminology overview. Because you want to avoid setting up a situation where users feel like they were duped into joining your mailing list, Opt-In features allow you to avoid accumulating bad kharma by giving your users the chance to choose whether or not to be added to a list. Single Opt-In allows your user to choose on your form whether or not they wish to join your mailing list. Double Opt-In will also send your user an email reminding them of their decision to join your list. The user will not be added to the list until they click a link sent in that email. This is to prevent a nemesis from signing up users for lists without their permission and to make sure the emails you’re going to send out to are verified. If you’d like to do some more reading on the value of Opt-In options and the pros and cons of each, the guys at MailChimp have provided a great writeup describing them in detail. The ability to set up Single Opt-In for both MailChimp and Campaign Monitor can be done right in the Wufoo interface in the Notification Settings. All you have to do is create a form with a checkbox field and then select that field for basing whether the user accepts being added to the mailing list under the Only Send If Choice is Checked. 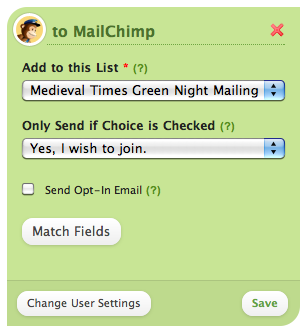 To set up a Double Opt-In form for MailChimp, it’s very easy. Just check the Send Opt-In Email setting in the integration settings and it’ll send a verification email to the user with a link to verify that they really want it. For Campaign Monitor, because Double Opt-In is set up at the list level, you’ll have to login to their service and set it up through their interface to make it work. You can learn about how to do that in our Campaign Monitor Integration Docs. For more information about these individual integrations, checkout our MailChimp and Campaign Monitor documentation.